Helicopter mama, Priya Nembhard, CEO of Moms Pump Here, and her oldest son, Jadon, are competing on the NEW reality TV series, “Stove Tots,” airing Monday, November 6th at 9pm ET on FYI. 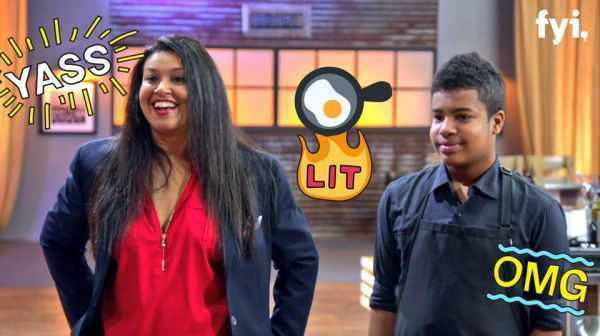 Her son will be one of many young chefs to showcase their cooking skills in the kitchen, head to head with other young chefs. In Stove Tots, viewers will see a first-hand look at the cut-throat world of junior culinary competitions. The series will follow the next generation of cooking masters – young maestros of the kitchen – as they prepare and compete in cook-offs across the U.S. These culinary prodigies have sophisticated palates, impressive knife skills, competitive drives and extremely involved parents. Each episode will feature a new group of culinary wunderkinds, along with their overbearing parents, as they prepare recipes, search for inspiration and deal with the pressures of competition. Like most competitive parents, Priya, will be in the kitchen rooting her son on. "Stove Tots is not like any other cooking show you will see on TV. The level of competition is fierce and the kids are extremely talented. My son is amazing in the kitchen and very proud of his cooking skills. As his mom, I'm not going to let anything get in the way of achieving his goals as a young chef!" says Priya about the show. The compatition follows three culinary phenoms as they go head-to-head in a two-round elimination tournament. Stove Tots is produced for FYI by Collins Ave, producers of Dance Moms. Priya’s episode will air Monday, February 5th 2018! You can follow Priya’s recap of the episodes via Twitter @priyanembhard and via her talk radio show, Follow Me Friday with Joan & Priya every Friday at 12pm ET on Talkradio.nyc. Join the conversation and the fun!